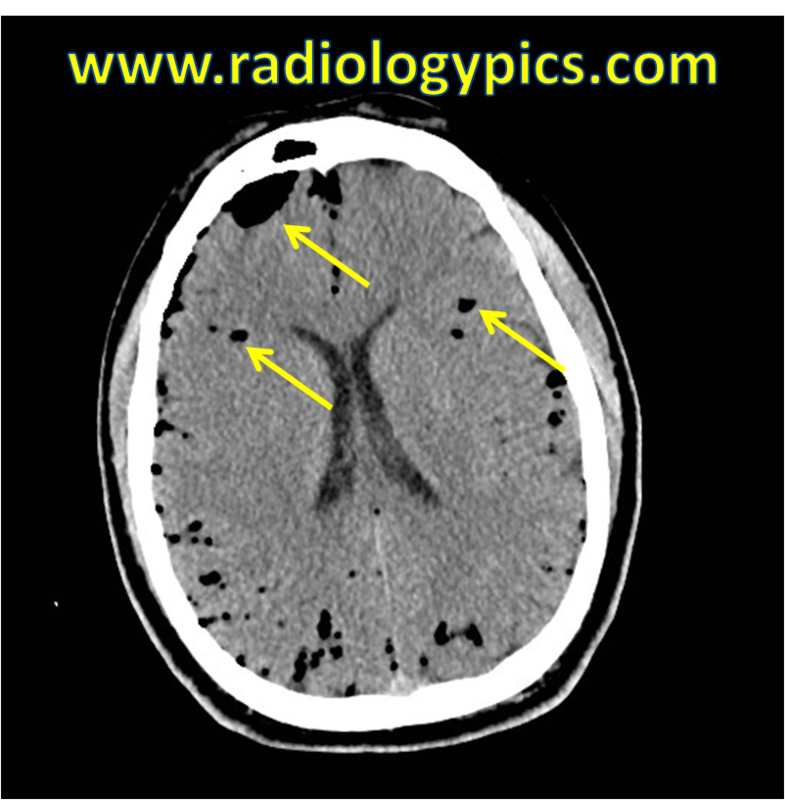 Pneumocephalus – diffuse low density bubbles of air (yellow arrows) are tracking within the sulci and collecting over the right frontal lobe. This is the best example of post-traumatic pneumocephalus I have seen personally outside of the literature. Pneumocephalus literally just means airhead, and is caused most often by trauma (in as many as 75% of cases). The second most common cause of pneumocephalus is iatrogenic from either ventricular shunt placement or brain surgery for any reason. Pneumocephalus is caused by a dural tear allowing air to enter the subdural, subarachnoid, or intraparenchymal spaces. In cases of trauma, this usually occurs because of an open skull fracture, or more commonly, a fracture of the paranasal sinuses or mastoid air cells (as was the etiology in this case). Intravascular air can be introduced via intravenous catheters and typically does not cause problems. Pneumocephalus places the patient at risk for infections, namely meningitis, cerbritis, brain abscess, and epidural abscess, as well as risk for cerebrospinal fluid leak. Read this interesting case report of intraparenchymal pneumocephalus after air travel here.